I stood next to Charles Stross at Eastercon a couple of years ago. He was signing books in the dealer hall. I didn’t know who he was until he walked away and I could see which books he’d signed. At that point I’d not read any of his work, so I was relieved that I’d not spoken to him and had to admit as much. 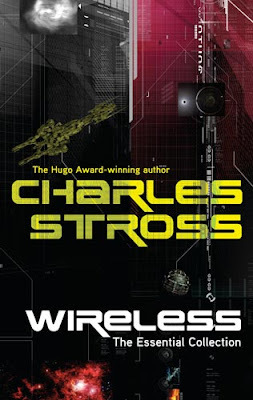 I was very pleased therefore to be reading Wireless, the new short story collection that showcases his work with stories ranging from flash fiction to novella length.